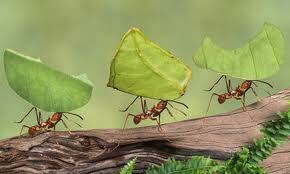 Remember that the ant is renowned in all ages for its social customs, prudence, frugality and productiveness. They know how to plan and collect their food in the right season and hibernate during wintertime. They are secure as they eat what they need today. Also, they eat enough to get them through the winter but don’t eat too much. If they didn’t eat enough today, they’d die and if they stuffed themselves on too much food, they’d burst. Moreover, they find the perfect stability and this is what financial health can be understood from their example. In other words, we need to look towards the future, while keeping an eye on the present. If we live too much in the present, while ignoring the future, we run the risk of abusing credit cards to satisfy our every impulse. Then we will be in big financial trouble in the future. If we live too much for the future, we risk not grasping the present. If we work too much, we miss out on our children’s lives and growth. W. Graham Scroggie, an English Pastor and writer observed, “There are two ways in which a Christian may view his money—“How much of my money shall I use for God?" or "How much of God's money shall I use for myself?" I hope that the last question should be where we stand as God’s stewards of what He has given to us. Fundamentally, this is where the dividing wall of genuine biblical success comes about: having the full understanding that God owns everything in our lives provides the basic premise for applying wisdom towards financial health. In order for us to become wise, there are things that we must avoid, (a) Watch out against the snare of greed (2 Corinthians 9:6-8; 1 Timothy 6:10); (b) Never co-sign unless you fully understand the liabilities (Proverbs 11:15; 22:26-27); (c) Don’t get tempted with “get rich quick schemes” (Proverbs 15:27; 1 Timothy 6:9-11). But, there are some things we must also adopt, (a) A concrete budget system (Proverbs 24:3-4; Luke 14:28-30); (b) seek wise financial counsels from godly people (Proverbs 12:15; 19:201-21; 1 Corinthians 15:33). In addition, we must begin to adapt to a new way of living, (a) Aspire to become debt-free (Psalms 22:7; Romans 13:8); (b) Practice generosity (Deuteronomy 15:10; Luke 6:30); (c) Recognize God’s ownership (Leviticus 25:23: Psalms 50:10-12). Finally, allowing oneself to become fully adept at these things will make a huge difference, (a) Live within your means and invest wisely (Ecclesiastes 11:2; Matthew 25:14-30); (b) Obey God’s financial strategy wholeheartedly to obtain success (Joshua 1:8; Proverbs 3:9-10). Altogether, we must take heed to St. Augustine’s counsel, “Where your pleasure is, there is your treasure; where your treasure is, there is your heart; where your heart is, there is your happiness.” While it is true that there are many voices that compete for our attention, there can be only one source of genuine counsel that we can truly trust, i.e., God’s counsel. Remember that God alone holds the key for us to attain the financial health we all long for in our life and family. Here’s one of His principles that we can mirror in our lives today: “One gives freely, yet grows all the richer; another withholds what he should give, and only suffers want. Whoever brings blessing will be enriched, and one who waters will himself be watered.” Thus, always keep in mind that God desires the best for us and aligning ourselves with His principles will guarantee our financial health at all times even at the worst of times. Believe Him and He will never let us down.